SHANGHAI, Feb. 16, 2016 -- Semiconductor Manufacturing International Corporation ("SMIC", NYSE: SMI; SEHK: 981), and Leadcore Technology Co. Ltd. ("Leadcore"), one of the core members of Datang Telecom Technology and Industry Group, jointly announce that SMIC's 28nm HKMG (High-K Metal Gate) process is ready with customer's NTO (New Tape Out) success. Based on this platform, Leadcore is launching a 28nm SoC (System on a Chip) for smartphones and other fields of applications, including high-performance application processor and mobile baseband functions. The chip has passed validation and is ready for mass production. SMIC is the first foundry to provide both 28nm PolySiON and 28nm HKMG processes in Mainland China. Compared with the traditional PolySiON process, SMIC's 28nm HKMG process can provide improved drive capability and transistor performance and substantially reduce gate leakage. Based on SMIC's 28nm HKMG process platform, the Smartphone SoC launched by Leadcore has better performance, higher speed and lower power consumption, and CPU performance achieves 1.6GHz. To extend Leadcore's success in 4G mobile communication market, this launch will expand the market share of Smartphones which are equipped with chips made in China. "We're glad to collaborate with Leadcore on 28nm HKMG process and develop advanced Smartphone SoC. 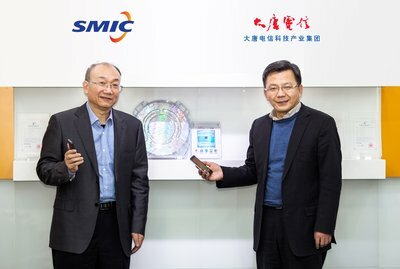 Following the successful adoption by mainstream smartphones of the chips based on SMIC's 28nm PolySiON process, our 28nm HKMG process has also been highly recognized by end customers and is ready for commercial use," said Dr. Tzu-Yin Chiu, Chief Executive Officer and Executive Director of SMIC, "We will continue to develop and improve 28nm derivative technology platforms and expect to introduce an enhanced compact version of 28nm HKMG process at the end of 2016, and provide more optimized processes to customers." Qian Guoliang, General Manager of Leadcore said, "Leadcore is dedicated to the R&D and application of the core technologies of 3G/4G mobile connectivity terminal and collaboration with ecosystem partners to create world-class products. This powerful industrial alliance with SMIC will promote domestic chip technology development and help Leadcore to improve the cost performance of our products to better serve the markets of Smartphone, smart car and robot and support 'Made in China 2025.' In the future, we will further strengthen our cooperation with SMIC and develop high-performance chip products based on more advanced technology nodes." As a member of Datang Telecom Technology Co., Ltd. ("DTT"), Leadcore Technology Co., Ltd. (LEADCORE) is dedicated to providing leading 3G/4G chip and mobile terminal solutions. With more than 1000 employees, Leadcore's headquarters are located in Shanghai, China, and its RD and service centers covers in Beijing, Shenzhen and Hong Kong. LEADCORE has always been adhering to independent innovation. Carrying on the positive results Datang Telecom Technology & Industry Group has achieved in terms of core technologies and patents in the fields of 3G and 4G, it has dedicated itself to the development and application of core technologies for 2G, 3G and 4G mobile terminals over the past 10-plus years. With an eye to smart phones, smart cars, smart homes and IOT, it has been continuously promoting the development of LTE and LTE-A terminal technologies through technological innovation. Its range of products encompasses various consumer electronics including smart phones, tablet PCs, data type terminals, wearable devices and vehicle-mounted OBD. For more information, please visit www.leadcoretech.com.